Mah Sing Group Bhd hopes to launch its maiden offshore project next year. President and group chief executive Datuk Seri Leong Hoy Kum said the company had not put its regional expansion plans on the backburner but was weighing all the risks and returns before venturing overseas. “Although we are not in a hurry, we see opportunities overseas. We are exploring Vietnam and China, and hope to identify the right local partners and land for our project later this year,” he told StarBiz. Mah Sing’s plans to venture abroad at end-2007 were put on hold when Vietnam’s economy encountered overheating problems. Leong said having seen how fast the country succumbed to its currency and economic problems, Mah Sing learned that it paid to be patient in its overseas plans. “Now that Vietnam’s economy and property market are stabilising, it is the right time to revisit our overseas ambition. The good thing is that land owners are more willing to negotiate now and we believe there is room for better terms for us,” Leong said. He said Mah Sing would study projects that fitted well with its business model of fast turnaround time and incurred minimum capital outlay, preferably with deferred payment terms. “The product types will depend on the results of the feasibility studies and could range from townships, landed or high-rise residences to commercial projects,” he added. He said Mah Sing would be using its war chest of RM900mil for its overseas expansion and to buy more land in the Klang Valley and Johor. Locally, it is holding talk with a few landowners for land acquisition of between 500 and 2,000 acres for greenfield township developments when the economy and property market recover. “We expect to firm up two or three land deals before year-end,” Leong said. Mah Sing has 16 ongoing projects in the country with estimated gross development value (GDV) of RM3.8bil over the next five to seven years. For the financial year ending Dec 31, it plans to launch RM400mil worth of property products and expects to record sales of RM450mil. 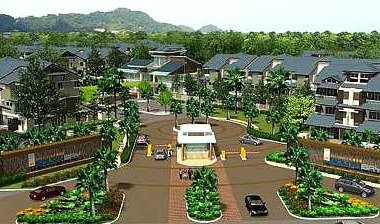 Some of the sales will be from its pre-constructed and on-going projects. Leong said sales from Mah Sing’s pre-constructed projects and the completion of The Icon Jalan Tun Razak in June would provide it with the necessary cashflow to ride out the slow market now. Meanwhile, income from the sale of The Icon office building for RM430mil two years ago will still be realised this year. According to Leong, the market is still very challenging and the company has to put in extra efforts to ensure good take-up for its products. For this year, it is looking at sales mainly from its Penang project, Southbay Penang, and other Klang Valley projects including Aman Perdana, Hijauan Residence, One Residence, Southgate and StarParc Point. In Johor, sales will be from Sri Pulai Perdana 2 and Sierra Perdana. Hatten Group, a local property developer, plans to turn the Bandar Hilir area in Malacca into a commercial district the likes of Ginza, Tokyo's classiest commercial centre. It is developing "Hatten Square", an upmarket commercial project located in the vicinity of Melaka Tengah and Melaka Raya. It features a four-star hotel with 260 rooms, 490 suites and 1,500 parking bays, and a mall with 200 retail units. Construction has begun on the RM150 million project, with full completion scheduled for the third quarter of 2011. However, the 1,500 parking bays and the 200 retail units will be ready by December this year. Hatten Group executive director Collin Tan said the successful completion of Phase 1 and 2 of Dataran Pahlawan, a new retail, entertainment and gourmet centre in Bandar Hilir, had resulted in the constitution of Hatten Group as a holding company for a group of companies with a unified vision to continue expanding in the area. "To be located near Dataran Pahlawan Melaka Megamall and Mahkota Parade, the proposed shopping mall will carry exclusive luxury brands targeted at the upper- and middle-income group together with sidewalk cafes and alfresco dining. 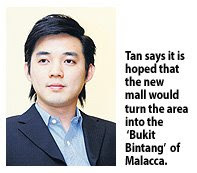 "We hope that this new mall would turn this area into the 'Bukit Bintang' of Malacca," he said, referring to the famous shopping and entertainment strip in Kuala Lumpur. Occupying 6.25ha , Hatten Square Suites & Shoppes will contain the hallmark of quality and innovation that buyers whom have long been associated with Hatten Group will recognise. "Apart from the retail units, the 22-storey building will comprise 270 hotel rooms and 490 premier suites with common hotel facilities such as an extensively designed swimming pool, a spa, a gym, a ballroom and 1,500 parking bays built with the intention to cater to business travellers and families on vacation," he said. Hatten Group plans to sell 40 per cent of the retail units at prices starting from RM180,000 per unit, and keep the rest as investment, implementing a similar development strategy practised in Dataran Pahlawan Megamall. "Upon completion of the project, the value of the properties is expected to appreciate by 20 per cent per year," said Tan. He added that Hatten Square will further complement the Bandar Hilir area by being the tallest building in Malacca, with good visibility of the historical city. Other factors going for the proposed project are that the area has a ready population of 400,000 people and is easily accessible from Jalan Laksamana, Coastal Highway and Jalan Tun Razak (Lebuhraya AMJ). "To ensure that all patrons to Malacca are able to enjoy and experience a comfortable and hassle-free shopping atmosphere, we are building a 17m wide air-conditioned two-tiered link bridge to connect the Square to Dataran Pahlawan Megamall and Mahkota Parade. "This has been designed to add vibrancy and colour to the Bandar Hilir area, commonly known for its busloads of tourist arrival to the neighbouring historical sites and shopping malls," said Tan. PENANG needs at least 200 to 300 new hotel rooms a year even if its economic growth stays below 5% per annum as a result of the global recession, says the Malaysian Association of Hotels (MAH), Penang chapte, chairman Marco Battistotti. Assuming the state’s economy annually expands by 5%, which was last year’s record, there is a need for 300 to 400 rooms. “New hotel projects that have been approved should be allowed to carry on so long as they are in accordance with the law,” Battistoti added. Despite the slowdown, airport arrivals in Penang for the first two months of the year were just slightly down at 464,634, against 527,203 in the first two months of 2008. “The Penang hotels’ occupancy rate for the first three months of 2009 was about 60%, compared with about 64% in the same period a year ago,” Battistoti said, adding that the hotel rates were competitive compared with prices in Bali, Bangkok and Singapore. “The daily room rates in these destinations have risen by about 20% and 25% since last year. “Presently, the average room rate in Singapore is about S$180, while in Bangkok and Bali, they are US$75 and US$94 respectively,” he said. Penang is attractive as a tourist destination not only because of its competitive room rate pricing. “The strength lies in Penang’s balanced mixture of beach and city hotels. It has 35 hotels, of which 22 are in the city and 13 are beach resort hotels. “Together they provide some 9,000 rooms,” he said. Due to the global recession this year, the MAH expected about 7% drop in tourist arrivals for Penang, Battistoti added. “The presence of low-cost carriers such as Firefly has helped increase tourist arrivals in Penang from other states in the country and the region. “Some 20 years ago in Europe when low-cost carriers first appeared, travel within the European continent also doubled,” he said. On the four approved hotel projects for inner George Town that hit a snag following the 18m height restriction guideline in the state heritage dossier, Battistoti said the MAH supported the projects . 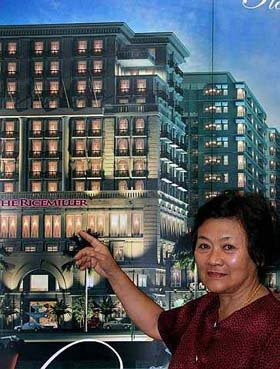 The hotels are the Eastern & Oriental Hotel extension project known as Annexe at Lebuh Farquahar, the Boustead Group’s RM130mil Royale Bintang Hotel and the Asian Global Business (AGB) Group’s Rice Miller Hotel in Weld Quay, and the Low Yat Group’s proposed hotel project at Jalan Sultan Ahmad Shah. The Eastern & Oriental Group obtained building plans approval from the Penang Island Municipal Council (MPPP) in 1996 for its 28-storey Annexe. However, it was scaled down to 15 storeys in 2008 when the 18m height restriction was imposed. The Boustead and the AGB Groups received MPPP endorsement for their projects in 2007 while the Low Yat Group’s proposed project received the go-ahead in late June 2008, less than two weeks before George Town was declared a World Heritage Site on July 7. Because of the controversial height guideline, the developers of the four projects have now taken a different stand on their projects. In a recent interview, AGB Group chairman Kate Lim said MPPP and the Unity, Culture, Arts and Heritage Ministry representatives had informed AGB verbally to scale down the proposed 51.7m Pier Hub project to 18m. AGB has yet to receive the go-ahead from the local authorities to commence building. “We are puzzled because the MPPP’s planning approval was given for a building 51.7m high. “The financing was also obtained for a project with this height. How is it possible to change the financing model now?” she said. Complying with the advice would cause the project to lose 70% of its gross commercial area, effectively rendering the whole project commercially unviable, Lim said. “If we cannot proceed as planned, we will have to seek legal redress,” she said. The Boustead Group declined comment. A source familiar with the Boustead project said the group would carry on work as it had already received the go ahead to start construction from the MPPP. “To stop work now would mean compensating the sub-contractors and that is a step that the Group don’t want to take,” the source said. E&O communication and investor relations director Lyn Chai said the group had recently stopped work and would await clarification from the relevant authorities expected in June. “When the Unesco height restrictions came to the forefront recently, we decided it would be in the best interests of George Town and consistent with E&O Hotel’s unique position as a heritage hotel, to review our plans and await formal notification,” she added. When contacted, a Low Yat Group spokesman said the group, which had invested in Penang since the 1960s, would continue to co-operate and work with the relevant authorities to bring progress to the state and to uphold the Unesco world heritage site status. “There are no immediate plans to make changes to the development order that has been approved,” he added. The Low Yat Group hotel project comprises 399 rooms and a double-storey basement car park. The three companies are Island & Peninsular Bhd, Pelangi Bhd and Petaling Garden Bhd. "It is too early to comment. This issue is very sensitive. Whatever we do, it must add value to our business," SP Setia president and chief executive officer, Tan Sri Liew Kee Sin told Bernama on the sidelines of PNB's Malaysian Unit Trust Week (MSAM) 2009 in Johor Baru today. Liew was commenting on a foreign news report quoting RHB Research Institute Sdn Bhd as saying that SP Setia may acquire the three real-estate companies from PNB to increase sales and gain financial backing from the government. The property units have a combined annual sales of more than RM1.31 billion, similar to SP Setia’s 2008 figures. As of Jan 30, 2009, PNB owned a 6.5 per cent stake in SP Setia, according to Bloomberg’s data. GIVING his backing for the four hotel projects to proceed, Real Estate & Housing Developer Association, Penang Chapter (Rehda Penang) chairman Datuk Jerry Chan said the blanket 18m height guideline for Penang’s inner city was not imposed by Unesco, as popularly believed. “It was inserted by the parties involved in the preparation of the dossier to be submitted to Unesco for the World Heritage Site status (WHS) listing application. “Rehda’s main grievance is that stakeholders such as the various ethnic communities and their chambers of commerce, guilds, and associations were not consulted in the preparation of the state heritage dossier. “After 2000, Rehda has not been consulted on the drafting of the guidelines for heritage zones,” he added. The controversy over the height of the projects has prompted Rehda Penang to publish a recent advertisement expressing concern over the increased restrictions imposed in the state’s heritage and buffer zones. The state planning committee had formulated guidelines in January allowing the development of high-rise buildings over 18m, subject to stringent conditions, said Chan. “We understand that Malacca in its listing submission did not bind itself to any height restriction,” he said. Chan noted there were existing buildings higher than 18m such as the Dewan Perniagaan Melayu building on Beach Street and the Bangunan Syed Putra on Downing Street, both located a stone’s throw from Boustead and AGB groups’ hotel projects. “There shouldn’t be any assumption that Penang would lose its WHS status if the projects are carried out. “Unesco has to clarify if it was aware of the MPPP approval for the four hotel projects with their respective specified heights. “If Unesco was aware, then it has assented to the listing not withstanding these approvals,” he said. Since the listing approval did not impose conditions that these projects had to be cancelled or scaled down, it could be inferred that they were not an issue nor a threat to the WHS status of Penang, he said. “The authorities should explain who is responsible for the conflicting situation on the approvals and the 18m height restriction. “Was the height restriction submitted intentionally or a genuine mistake?” he said. Chan said if the state government believed in the economic benefits to be generated by the hotel projects, it should defend these projects. Meanwhile, Penang Heritage Trust (PHT) president Dr Choong Sim Poey said the PHT was surprised that MPPP could have failed to apply Unesco heritage guidelines on the four hotel projects. “The regular meetings of the state heritage conservation committee held since 2000 under the chairmanship of the previous Chief Minister were fully aware of the conservation guidelines of the heritage city. “All the relevant state and MPPP officers, and Rehda and PHT representatives were part of this committee,” he said. He added that losing the Unesco recognition would affect all businesses in the inner city. Choong said: “A price has to be paid for this mistake; either in losing the Unesco status or compensating the developers.